The Great Raid of 1840 was the largest raid ever mounted by Native Americans on white cities in what is now the United States. It followed the Council House Fight, in which Republic of Texas officials attempted to capture and take prisoner 33 Comanche chiefs who had come to negotiate a peace treaty, killing them together with two dozen of their family and followers. The Texas Officials were determined to force the Comanche to release all white captives among them. To avenge what the Comanche viewed as a bitter betrayal by the Texans, the Comanche war chief Buffalo Hump raised a huge war party of many of the bands of the Comanche, and raided deep into white-settled areas of Southeast Texas. Comanche War Chief Buffalo Hump was determined to do more than merely complain about what the Comanches viewed as a bitter betrayal. Spreading word to the other bands of Comanches that he was raiding the white settlements in revenge, Buffalo Hump led the Great Raid of 1840. Buffalo Hump gathered a huge raiding party, at least 400 warriors, with wives and young boys along to provide comfort and do the work. Altogether as many as a thousand Comanche may have set out from West Texas on the Great Raid. On this raid the Comanches went all the way from the plains of west Texas to the cities of Victoria and Linnville on the Texas coast. In what may have been the largest organized raid by the Comanches to that point, they raided and burned these towns and plundered at will. 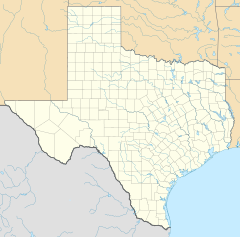 The huge war party crossed into central Texas and first attacked the town of Victoria. Although rangers had found the tracks of a gigantic war party coming out of West Texas, and were shadowing the onrushing Comanches, part of the war party broke off and attacked Victoria before the citizens could be warned. One resident wrote, "We of Victoria were startled by the apparitions presented by the sudden appearance of six hundred mounted Comanches in the immediate outskirts of the village." The citizens of Victoria hid in the buildings, and the Comanches, after killing a dozen or so townspeople and riding up and down, departed Victoria when rifle fire from the buildings began to make the riding dangerous. The war party intended to gather horses and loot the coastal towns, which were not as prepared for the Comanches as the central Texas cities. On August 7, 1840, the Indians surrounded the small port of Linnville, Texas, which was the second largest port in the Republic of Texas at the time, and began pillaging the stores and houses. Linnville, which is now a ghost town, was located 3.5 miles northeast of present day Port Lavaca. The Comanches reportedly killed three whites, including customs officer Hugh Oran Watts, who had delayed his escape to retrieve a gold watch at his home (reportedly a family heirloom). After killing Watts, the Comanche captured his wife of only three weeks, the former Juliet Constance, and a black woman and child. Realizing that the plains Indians would have no experience on water, the townspeople fled prudently from the Comanche raiders to the safety of the water. They were saved by remaining aboard small boats and a schooner captained by William G. Marshall, which was at anchor in the bay. While safe in the water, the refugees witnessed the destruction and looting of their town, unable to do a thing except curse impotently. For that entire day the Comanches plundered and burned buildings, draping themselves grandly in top hats and stolen linens. They tied feather beds and bolts of cloth to their horses, and dragged them. They herded large numbers of cattle into pens and slaughtered them. One outraged citizen, Judge John Hays, grabbed a gun and waded ashore through the shallow water, and roared at the bemused warriors, but the Indians chose to spare him, believing him mad. He later found that he had waded ashore to face nearly a thousand Indians with an unloaded pistol, as if that one weapon could have made a difference. At the time of the Great Raid, many trade goods were en route from overseas to New Orleans, Louisiana to San Antonio, Texas and Austin, Texas; a total inventory valued at over $300,000 was reported to be at Linnville at that moment, including an undisclosed amount of silver bullion. Linn noted that in addition to the cloth and other trade goods usually present in his warehouse at that time were several cases of hats and umbrellas belonging to James Robinson, a San Antonio merchant. "These the Indians made free with, and went dashing about the blazing village, amid their screeching squaws and `little Injuns,' like demons in a drunken saturnalia, with Robinson's hats on their heads and Robinson's umbrellas bobbing about on every side like tipsy young balloons." After loading loot onto pack mules, the raiders, grandly attired in their booty, finally began their retreat on the afternoon on August 8, 1840. The Rangers had been trailing the war party for some time, unable to engage them because of their sheer numbers. But the three days of looting at Linnville gave the militia and Ranger companies a chance to gather. Volunteers from Gonzales, Texas under Mathew Caldwell and from Bastrop under Ed Burleson, with all the ranger companies of east and central Texas, moved to intercept the Indians. They made contact at Plum Creek, near the city of Lockhart, Texas, on August 12, 1840. The Comanches, who normally fared about as a fast and deadly light cavalry, were detained considerably by the captive, slower pack mules. The normal Comanche tactic was to ride as fast as possible away from the scene of a victory, but on this occasion they slowed to a gentler pace acceptable to the heavily laden pack mules. Thus, the militia and rangers caught the raiders, which normally they found impossible. The battle of Plum Creek was really a running gun battle, where the Texans attempted to kill the raiders and recover loot, and the Indians simply attempted to get away. Although only a dozen bodies were recovered, the Texans reported killing 80 Comanches, and the war party losses were probably higher than normal. But greed saved the Comanches in turn; when the militia discovered the stolen bullion, they abandoned the fight, divided their loot, and went home. The Great Raid of 1840 was the largest Indian raid on white cities in the history of what is now the United States—though technically when it occurred it was in the Republic of Texas and not in the United States. The war party literally burned one city to the ground. They took over 3,000 horses and mules, and hundreds of thousands of dollars of other plunder, ranging from silver to cloth and mirrors. Unfortunately for the war party, the sheer volume of loot slowed them down, and made them vulnerable to attack from a militia that otherwise would never have caught them. Equally, the militia missed an opportunity to destroy the bulk of the raiding party when they concentrated on recovering and dividing the recovered bullion and other plunder. ↑ 2.0 2.1 The Comanche Barrier to South Plains Settlement: A Century and a Half of Savage Resistance to the Advancing White Frontier . Arthur H. Clarke Co. 1933. ↑ 3.0 3.1 The Comanches: Lords of the Southern Plains . University of Oklahoma Press. 1952. ↑ 4.0 4.1 Roell, Craig (2001-06-06). "The Handbook of Texas Online". LINNVILLE RAID OF 1840. http://www.tshaonline.org/handbook/online/articles/LL/btl1.html. Retrieved 2007-11-04. ↑ 5.0 5.1 R.E. Moore (2000). The Texas Comanches. Texas Indians.com Accessed 2007-11-04. ↑ John J. Linn, Reminiscences of Fifty Years in Texas (1883). ↑ Roell, Craig. "Handbook of Texas Online". LINNVILLE, TEXAS. University of Texas at Austin. http://www.tshaonline.org/handbook/online/articles/LL/hvl58.html. Retrieved 2007-11-04. ↑ "Texas Military Forces Museum". Indian Fighting. http://texasmilitaryforcesmuseum.org/tnghist8.htm. Retrieved 2007-11-04.